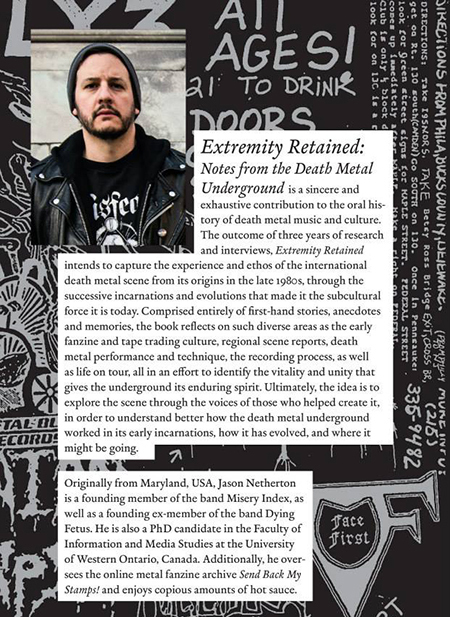 Misery Index’s Jason Netherton is on the second pressing of his entertaining and informative book Extremity Retained: Notes from the Death Metal Underground. He posted on his Facebook page for the book that there’s less than 50 print copies left, and for interested parties to email him for a copy “and we can figure out the best way to get one to you.” (Your editor worked on the book project for Jason and we’re all about supporting it.) Contact Netherton at JasonNeth [at] gmail [dot] com. Handshake, Inc. released the paperback edition as well as a companion compilation of death metal songs on cassette. You can listen to the compilation at the Bandcamp page for the book. This entry was posted in News and tagged book, death metal, extremity retained, handshake inc., jason netherton, Misery Index by Editor. Bookmark the permalink.